Welcome to the Family Music Zone! We want you and your little ones to continue the music making at home and on the go – so we made it really easy! The Family Music Zone is a place where you can stream and download your music, and find more ways to play along with Music Together® at home. Log into your account here or create a new account if you are a new family! 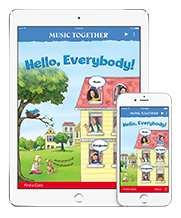 Log in to our Hello Everybody App on your mobile device(s) using the email address and password you used to create your Family Music Zone account, and your Music Together songs will be preloaded. Plus, you can turn the vocals off and try some Music Together karaoke! All in a rich variety of tonalities and meters that you won't hear as often on Pandora! We also offer Music Together in Spanish now where the entire collection is translated! Each song is brought to life through illustrations by award-winning artist Jaime Kim that will inspire your family to sing and snuggle at home! Your participation as a music-maker in class, and every day is the best support of all! What do you do? Sing the music at home AND all over town! Dance to the music at home! Makeup new lyrics to songs! Role-model for your child that making music is joyful, and you don't have to be perfect and they will absorb that message from you! Research shows out that most children will NOT participate in class, THEY WILL PARTICIPATE AT HOME!! They absorb the music in class and then allow it to come out at home! So, don't worry if you don't know the words or if you don't think you can sing. Do it anyway. Your child will remember that you sang for her and that music is a part of all of us.